Nerf Elite Stryfe with the new Elite Special Edition Darts? Aparentemente a Edição especial do dobro dos dardos da Stryfe vem com a edição especial dos Dardos Elite. 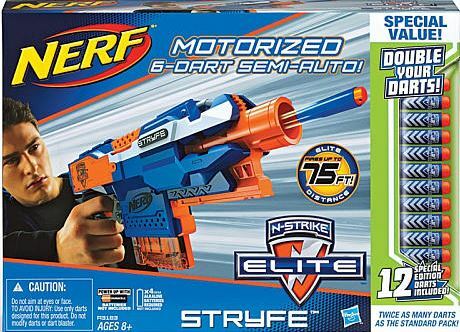 Apparently the Special double of your darts Stryfe bring the has coming with the new Nerf Elite Special Edition Darts. This entry was tagged Darts, Edition, Elite, ExtremeNerf, Hasbro, Nerf, semi-auto, Special Elite Darts, Stryfe. Bookmark the permalink. Nerf Games, wallpaper´s, app´s, target´s, etc. I don’t really like this deal. The Stryfe usually goes for about $20. So your paying an extra $5 at Toys R Us for 6 more darts. At most retail stores, you can get a pack of 12 Elite Darts for $6. I would rather just buy a normal priced Stryfe and a 12 pack of darts if I wanted that many. But, what do you think about the special darts that we see in the box??? Psyk bought the double of your darts edition of the Maverick on Toys R Us and the darts were normal. except this post is actually a good article, keep it up. thus it’s fastidious to read this website, and I used to pay a visit this website daily. information you offer. It’s good to come across a blog every once in a while that isn’t the same old rehashed material.